Jigsaw Mania is a jigsaw puzzle game for the PC. With over 600 high quality puzzles, Jigsaw Mania can create puzzles easily from any picture with a wide range of options such as altering the number of pieces and changing the piece shape and size. 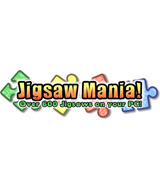 Jigsaw Mania allows you to "Gift-wrap" jigsaw puzzles into self-contained executable files which you can then email to someone who doesn´t have Jigsaw Mania. For example, you could create a puzzle from a holiday snap, gift-wrap it, and then email it automatically to a friend or family member. Jigsaw Mania makes the whole process simple and easy to understand. With over 600 puzzles included, plus the ability to make and send your own, Jigsaw Mania offers an outstanding set of features and endless hours of enjoyment for your entire family.